The exact number of mountain gorillas living within the verdant forests of Uganda (Bwindi impenetrable forest national park and Mgahinga forest) today is not known. However Uganda is said to have more than half of the total number of mountain gorillas living on the planet earth. As per the gorilla census which was conducted a couple of years back, the Bwindi forests had more than 400 gorillas while Mgahinga forest had more than 80 gorillas. There are 36 gorilla families living within the impenetrable Bwindi forest, and the others in Mgahinga Gorilla forest Park. Gorilla habituation is a two year process that involves familiarizing gorillas to human beings. The gorillas continue with their day to day activities within their wild natural environment the even when people are in their presence. In accordance with the Uganda Wildlife Authority (UWA) conservation regulations, a maximum of 8 adults are allowed to visit / track a habituated gorilla family each day. How many Habituated Mountain Gorilla Families are in Uganda? Today Uganda prides in a total of 12 Habituated Mountain Gorilla Families. Of these 11 are found within Bwindi impenetrable national park and the other a migratory group living in Mgahinga forest Gorilla Park that commonly moves between Uganda and the neighboring DR Congo. Below are the habituated mountain gorilla families with their respective locations in Uganda. This Uganda’s the oldest habituated mountain gorilla group living in the Mubare hills, within the depths of Bwindi forest. This family was successfully habituated back in 1998. Initially, it only comprised of 12 members, and “Ruhondeza” was the leading dominant silverback. A couple of years later this group increased to 18 individuals, sadly because of some moving to other gorilla families and fights with other wild-gorilla groups, it lost most of its members including the dominant silverback Ruhondeza tht used to protect the family. After all that tragedy, 5 gorillas survived, however, in 2013, four other members among who was a dominant silverback were joined to the family. Today this is the most loved family to track due to its convenient location. The Habinyanja Gorilla Family is among the very first families to receive visitors in Uganda. Its name was derived from a local word “Nyanja” that means ‘ water body’. And this is so because the group was first seen in a swamp within Bwindi Impenetrable Forest. The Habinyanja family is recognized for its too much drama as well as commotion caused by power struggles between the two dominant silverbacks fighting for leadership. The family came into existence in 2002, after a silverback broke off from the Habinyanja group. Initially there were 12 individuals including five females. It was called Rushegura a name derived from “Ebishegura” which is a tree specie that is plentiful within the area where this family lives. Its normally close to Buhoma village and many a times seen in the vicinity of Gorilla Forest Camp. This is one of the recent mountain gorilla families within Bwindi Impenetrable National Park which was opened in 2011 for tourism. The dominant Silverback leading this group is “Tibirikwata”. It is also another well liked family due to its energetic as well as playful juveniles. This group which was opened up in 2004 for tourism was first seen up on a hill and because of that it was named Nkuringo a word in the local rukiga language that means “round hill”. Then the family was led by Nkuringo as the dominant silverback who unfortunately passed away in April 2008. It left behind two Silverbacks Rafiki plus Safari; the later took over leadership and that very year in the month of November new-born twin baby mountain gorillas (Katungi and Muhozi) happily arrived. Sadly, at one and half Katungi died of an illness. Nshongi Gorilla Family wasopened up for tourism towards the end of 2009. It was the largest habituated gorilla family having 36 members. Its name was derived from river Nshongi, where the family was initially seen. This family which had 4 silverback split in 2010 leaving 26 members. The spit gorillas formed Mishaya Gorilla Group. Initially it had 27 individuals among which were 3 silverbacks. Rumansi is the dominant male leading the family. Rwigi and Ruhamuka are the old males. 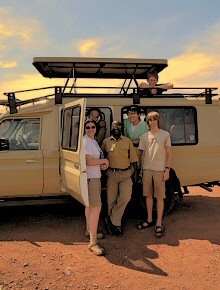 In 2011 this group was opened for tourism; however it split shortly to form Busingye Gorilla Family. Before the separation, the family consisted. 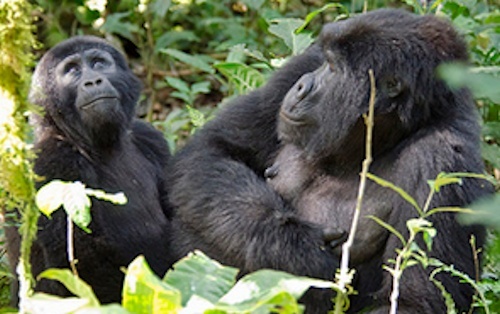 Busingye Gorilla family broke off the Kahungye Family mid 2012. Busingye is the Silverback with 9 members including two adult females, three infants and other youths. It was introduced for tourism in 2013.
is the single family within Mgahinga Gorilla Park. its dominant Silverback, loves travelling and crosses borders between DR Congo, Uganda and Rwanda often. However since end of 2012, they settled in Uganda In May 2013 they received a newborn baby gorilla. So far these are the habituated gorilla families I Uganda. We shall keep updating you about the formation of other families. For any additional information reach us through our contact us page.